KNOXVILLE, TN--(Marketwired - Jul 18, 2016) - Chris and Diana Elrod, a husband and wife team living in McMinn County, recently combined their entrepreneurial spirit and backgrounds in production management, quality control, and customer service to invest in Dryer Vent Wizard, (DVW). Founded in 2004, DVW is a fast-growing North American franchise that specializes in dryer vent repair, replacement, alteration, cleaning and maintenance for residential and commercial clients. Diana Elrod manages the business end while husband Chris makes service calls to customers throughout southeast Tennessee, including the counties of Blount, Loudon, McMinn, Monroe, and Sevier. According to the Elrods, Dryer Vent Wizard gives them the opportunity to raise community awareness about energy efficiency and fire safety. In the U.S., it is estimated that poorly maintained or clogged dryer vents are the leading cause of appliance fires, resulting in more than 15,500 dryer fires every year. These are only the reported cases. "Families today have such busy lifestyles that they don't think about the fire hazard that may be lurking in their clothes dryer from lack of maintenance and cleaning," said Diana Elrod. "They may notice that it takes three cycles to dry a load of clothes or that something's wrong with the dryer, and not ever consider the safety issues." During one service call, Chris Elrod not only collected five gallons of lint from a customer's dryer, he also retrieved a debit card, diamond earring and thirty dollars in cash that he returned to the embarrassed owner. The Elrods, who have an 11 year-old son, also enjoy the flexibility of their business which gives Chris the opportunity to organize activities in the local youth football league and Diana the time to participate in an elementary school youth mentoring program. Today, when others ask the couple about their new business venture, the Elrods quickly respond, "It's about family safety." Headquartered in Farmington Hills, Michigan, Dryer Vent Wizard is a member of the National Fire Protection Association (NFPA). DVW's 70 plus franchisees serve more than 9,000 communities throughout the U.S. and Canada. For more information and to learn more about franchise opportunities, visit www.DryerVentWizard.com or call 866-498-SAFE (7233) in the U.S. and 866-395-SAFE (7233) in Canada. 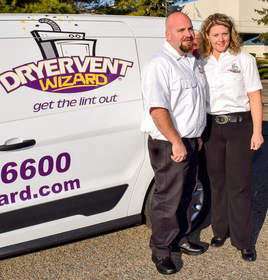 Chris and Diana Elrod are pictured by their Dryer Vent Wizard van.